» home » magazine » 2012 » april 2012 » which press is right for you? Generally, a traditional mechanical press can achieve the highest production speeds, especially when running relatively flat parts with simple, shallow forming requirements. A hydraulic press offers more versatility in tonnage and working energy to allow for more complex processes and forming. A mechanical servo press combines versatility and higher production speeds. Stamtec offers all three press types—mechanical, hydraulic and servo (of both drive types). • Fixed stroke length, although variable-stroke-length presses are available from some manufacturers. • Special slide motions, such as link motion, are available, specific to a particular press. • Variable slide velocity, although slide-velocity profile within a single cycle of the press is fixed. • Working energy depends on flywheel mass and speed. • Full press capacity near stroke bottom dead center (BDC). • Simplicity of setup and operation. • Typically the highest stroking speeds. • High accuracy and repeatability, with relatively low initial cost. A hydraulic press generally does not achieve the high cycling speeds of a similar-sized mechanical press, but offers more versatility with its variable stroke length, die space and pressure. A hydraulic press often is the best choice when producing parts with deep, complex forms that require a lot of material flow, parts that require a dwell at the bottom of the stroke (including plastics) and when production speed is not as important. • Slide motion and position control throughout the stroke. • Variable slide velocity, even within a single cycle of the press, typically configured as fast approach, slow press and fast return. • Full working energy at any speed. • Full press capacity at any point in the stroke. • Adjustability of stroke length, slide motion and velocity, and working energy. • Generally reduced throughput, accuracy and repeatability compared to a mechanical or servo press, with relatively low initial cost. A mechanical servo press (flywheel, clutch and brake are replaced by high-capacity motors): offers much of the versatility of a hydraulic press at production speeds often approaching that of traditional mechanical presses. Stroke, slide motion and position, and speed are programmable to allow different combinations that can work with a variety of dies, part types and production speeds. • Precise slide motion and position control throughout the range of the stroke. • Variable, precise slide-velocity control, even within a single cycle of the press stroke. • Programmability of all of the above-mentioned parameters. • Full press capacity near stroke BDC. • Generally greater cycle speeds than a hydraulic press, in many cases approaching the speed of a traditional mechanical press. • High accuracy and repeatability. • Relatively high initial cost. 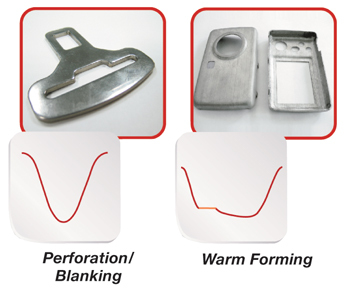 Shown are examples of stroke profiles and parts that can be achieved with a servo press. 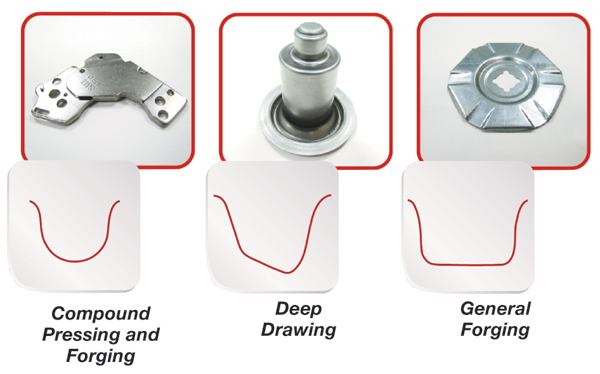 Metalformers can select from two types of servo-press drive technologies. A link-assisted drive system provides a cost-effective solution that utilizes standard, off-the-shelf AC servo motors. A link or toggle mechanism coupled with the motors creates mechanical ratios that allow use of standard motor sizes from proven motor and control suppliers. No proprietary motors or motor controllers are required. A direct-drive system employs proprietary, high-torque low-rpm motors specifically designed for press applications. These motors replace the standard motor, flywheel and clutch/brake in an otherwise traditional crankshaft-style mechanical press.